American country duo Florida Georgia Line is one of the most successful country music acts of the 2010s. 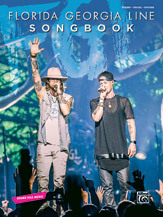 Fronted by co-founders Tyler Hubbard and Brian Kelley, the group has had numerous number-one albums and singles. Their 2014 single "Cruise" became the best-selling digital country song of all time in the U.S. and is the only country song to ever sell over 10 million copies. This 18-song collection highlights Florida Georgia Line's expanding catalog of hits. Titles: Anything Goes * Confession * Cruise * Dayum, Baby * Dirt * Get Your Shine On * H.O.L.Y. * I'm in a Hurry (And Don't Know Why) * It'z Just What We Do * May We All * 'Round Here * Sippin' on Fire * Stay * Sun Daze * Take It Out on Me * Tell Me How You Like It * This Is How We Roll * Tip It Back.